Enjoying a great tasting coffee doesn’t mean you need to have all of the caffeine too. Our Lungo Decaf is just as smooth and tasty as the original, but it is made with a decaffeinated blend of coffee. So whether it’s late in the evening or you just don’t fancy the caffeine, you can enjoy our popular Lungo without putting taste to one side. This literal ‘long espresso’, a shot of decaffeinated espresso made with a little more hot water, is a coffee you can take your time over at breakfast, lunch and beyond. With an enticing aroma and that traditional layer of crema on top, the drink packed into these coffee pods isn’t one to miss. 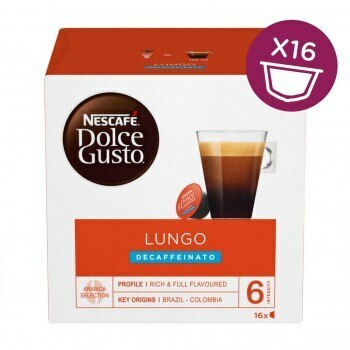 Simple but confident, the Lungo Decaf is best enjoyed any way you like it, without or without milk. However you make it your own, it’s a great little number for any time of the day, whether you’re kicking back by yourself or enjoying with friends. You can be sure of a great outcome every time, too, as your NESCAFÉ® Dolce Gusto® machine crafts your drink to coffee shop quality. If you want to dress your coffee up a little, enjoy in our Iconic Porcelain Lungo Cups, the stylish and unique choice that complements the modern design of your NESCAFÉ® Dolce Gusto® machine. Decaffeinated Roast and Ground Coffee. Not an offer at all. Asda's is the same price! Need to watch these so called offers. Being conned if you ask me. I wouldn't have given 1 star unless I had to. We're sorry you're disappointed with the promotional price and can assure you that we're doing our best to keep the price to a minimum. Please note, when you are buying from a retailer, the resale prices are at their sole discretion. Buy this regular as I need to drink decaf and found this to be tremendous. My only issue is I’m a massive coffee drinker but the decaf stuff is very limited. We need more choice and I’d spend even more! I regularly buy Lungo decaff and it is great. I sometimes buy the americano but this is not a decaff product.PLEASE can we have some more decaff in your range of excellent coffees? A lovely decaff coffee with no after taste. My choice everytime now, I will not drink anything else. Its a shame that you do not offer more decaff coffees that I can try. I have a problem with the caffeine buzz, so this is amazing, really enjoy it black and with rice/hemp milk. Would love it if DG could do a longer decaf as well, but i suppose as i use two at a time for a bigger cup I can manage - please think about a longer one though!! Like many people I can't take too much caffeine. 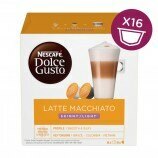 I find that I either have to add ordinary milk or buy milk pods from Amazon to make a white decaf. I wish I could order milk pods directly as they are by far the best way to enjoy this coffee. Great to be able to have a real tasting decaff. I use it all the time and just wish there were more varieties of decaff available in the pods. Quite a distinctive smokey flavour some might say roast some might say burnt. Also a hint of the chemical aftertaste of decaf as if it's been brewed with water from a swimming pool. Don't let this put you off though the Lungo is a challenging coffee and can be made with more or less water and maybe a little milk but getting it to your taste can be tricky. Get it right though and it makes a rewarding drink.